The main difference of this group of cruise ships from original Grand Princess design (Grand Princess, Golden Princess, Star Princess ) is additional deck accommodating 500 more passengers. Other architectural and color differences between Grand Princess subclass, Caribbean Princess and Crown Princess subclass (Crown Princess, Emerald Princess, Ruby Princess) reflected in our models - see pictures. Model length 9 1/16 "(23 cm). Scale:1:1250. If you want to pay by check or money order please email your request and shipping location. 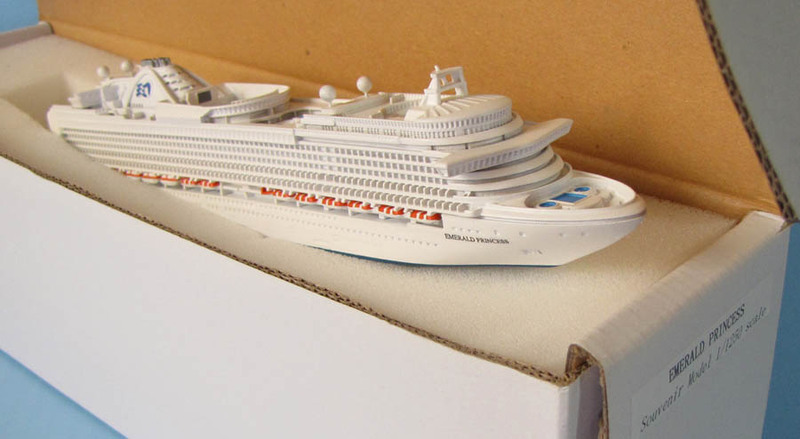 Model Description: Souvenir Series waterline cruise ship models in scale 1:1250. Made to high quality standard and affordable for every cruising fan. This is simplified version of our more detailed and encased models of Collector's Series 1/1250 scale. Unlike ship sculptures sold onboard, these models are expertly designed to exact ship's lines and architecture. Factory made of heavy and strong cold cast resin to withstand direct handling. Nicely finished. Come in ready to ship strong cardboard boxes with secure foam packing inside. SCHERBAK models are the best memos of any Cruise Vacation, best gifts for Cruise Wedding, Honeymoon or Anniversary Cruises.